Hi everyone! 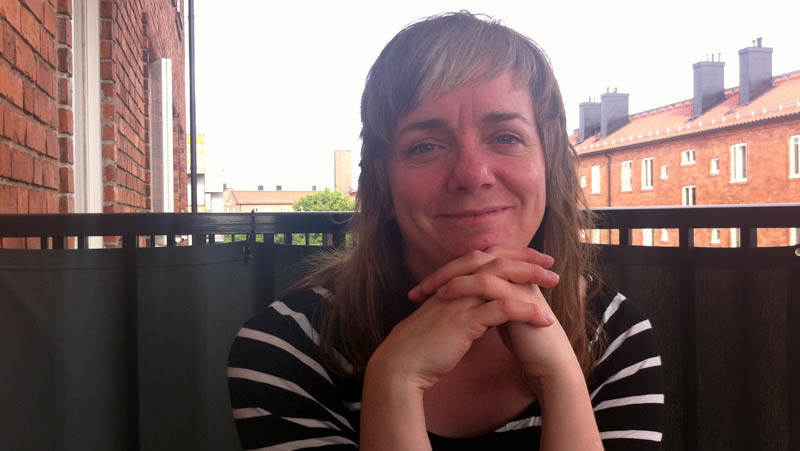 My name is Nina Johansson, I live in Stockholm, Sweden, where I work as an arts, photography and design teacher. This is my third USk symposium. 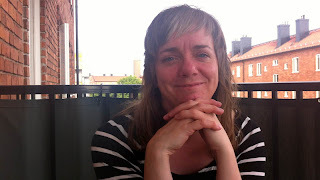 I gave workshops in both Lisbon 2011 and Santo Domingo in 2012, this year I am going as a participant, to enjoy learning from so many skilled sketchers in workshops and demos and whatnot - and of course to enjoy Barcelona, my fav city in Europe! I have been to Bcn three times before, the last time was in August last year, when I had the opportunity to draw for ten days around the Sagrada Família for a book. I really can´t get enough of this beautiful and inspiring city, and I am looking so much forward to meeting both old and new friends, and spending a whole week sketching there together with you all! My trip prep has not been too rigorous until now, I have been preparing for an exhibition, and delivered the paintings to the gallery this thursday. Now I can finally get into Barcelona mode, and start packing! As for art materials, I am bringing my usual pen case with some fountain pens and waterbrushes, and a tiny bijoux box of watercolours. Nothing new there, really. I´ll take my big palette too, that I use for bigger formats and big brushes. 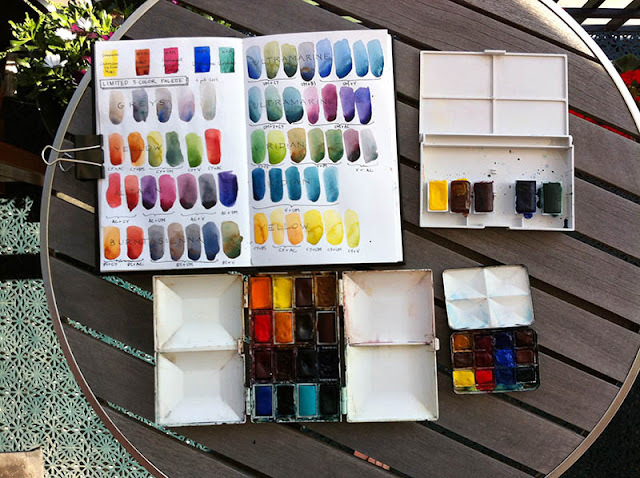 But the really exciting thing this year for me (colour nerds - ahoy!!) is a new, limited, five-colour palette that I just started experimenting with. I read about it a few weeks ago somewhere online, and decided to try it out: cadmium yellow (I never used cadmium colours before), permanent alizarin crimson, burnt sienna, ultramarine and viridian. I´ve been doing some mixing charts with it, to see what I can do with it, and I must say I´m pretty impressed of the range of colours I am getting out of these few! Looking forward to finally seeing you again Nina! 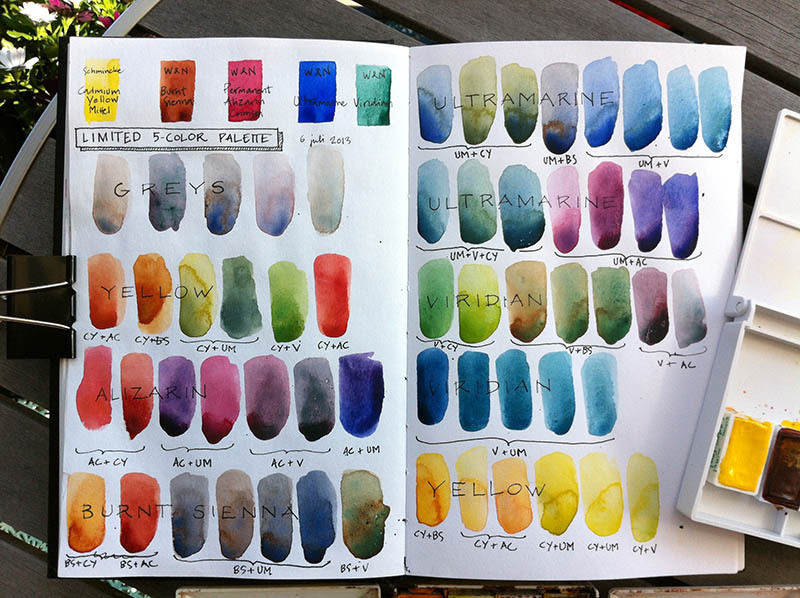 And thanks for sharing your color tests, v impressed with the five-color palette! That palette looks great! See you soon! Very cool, Nina...see you soon! 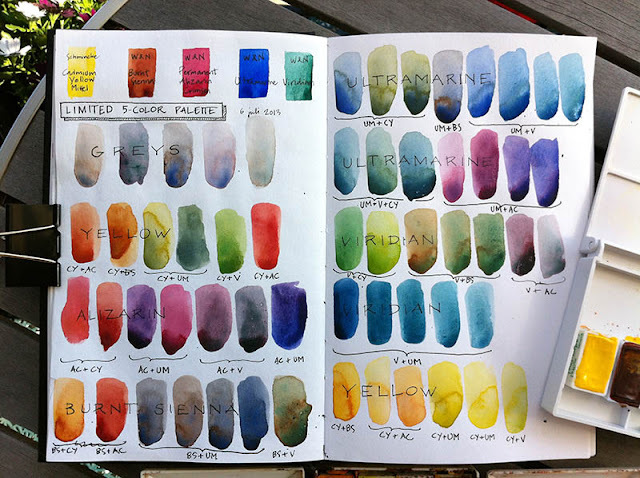 What a delicious-looking palette of color mixes! See you soon! see you soon in BCN and thank you again for your tips using waterproof ink! In addition to Noodlers and Platinum from overseas I found a traditional German manufacturer who sells calligraphy ink (product range called "Antiktusche"). This works perfect with my fountain pen so far.